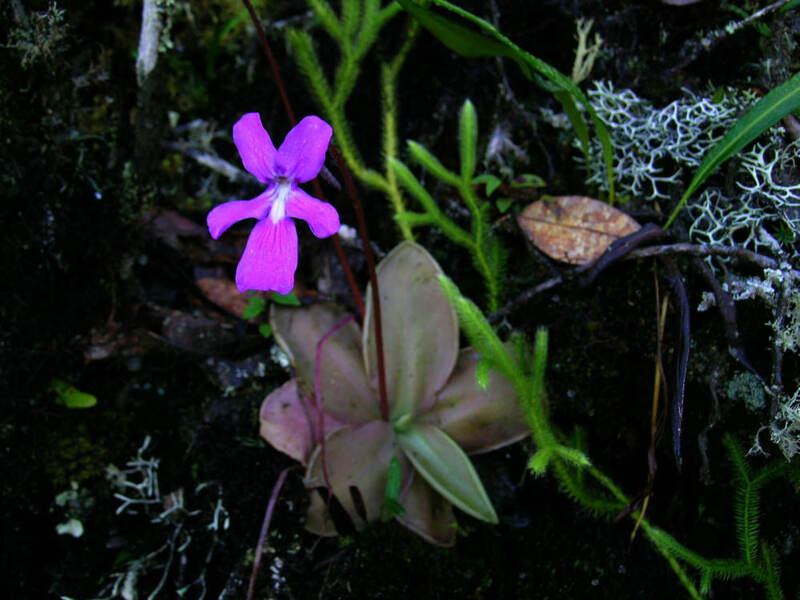 Another 1400km over the weekend, this time to and through the famous state of Oaxaca - also known as Pinguicula heaven, hehehe ! Too much to see in too short a time, so I had to concentrate on a few species. Plus you never know how much time you will take to find each species, how long you will spend at each site, or what surprises you will run into along the way. My first objective was P.mirandae, known from N Oaxaca, right across the border from Puebla state, ~250km away from Mexico City. Therefore I left early Saturday morning before sunset (5:30am), so as not to waste valuable sunlight time driving around. 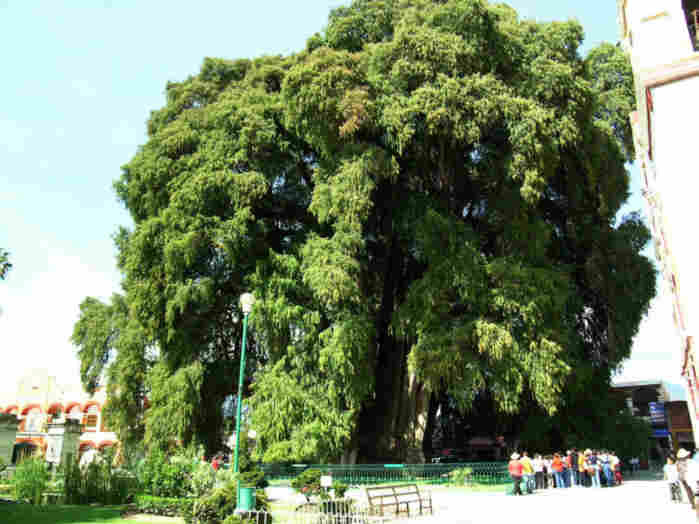 I arrived in Teotitlan and started searching for Santa Maria Ixcatlan, the type location (and only place where P.mirandae has been collected). I discovered its location with the help of some locals, but it apparently was easier to reach by a dirt road from a highway parallel to the one I was on, coming from the other side of some nice mountains to the W. I would have to drive ~100km around or risk taking unmapped dirt roads of unkown quality. So I decided to leave it for the return trip to Mexico city, when I would drive by this other highway. 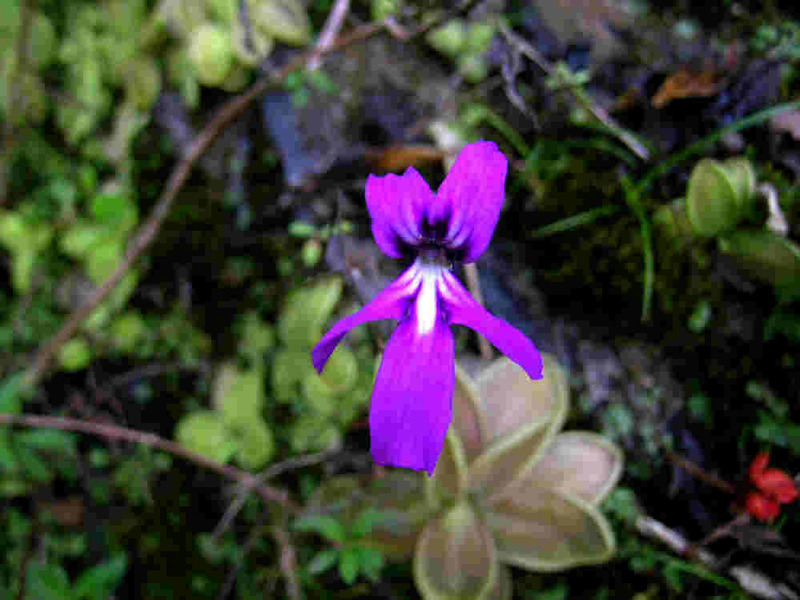 From Teotitlan I drove up the Sierra de Mazateca, on the other side of which had been collected the famous P.gigantea. 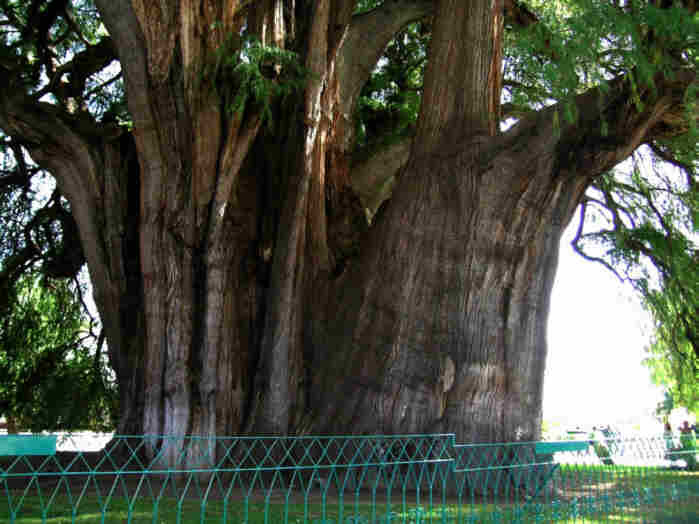 The whole valley where Teotitlan is located is one big desert with some beautiful xerophytic scenery. Driving up the winding road that led to the top of the Sierra Mazateca, at ~1800m I came across the first oak(?) forests. 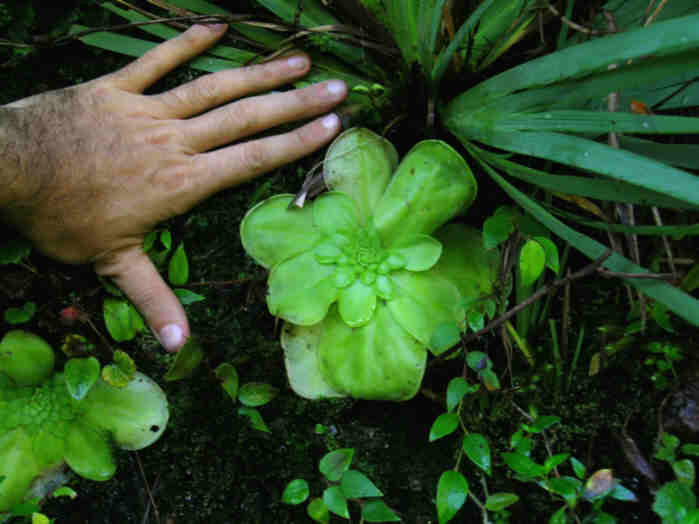 From my short experience with Pinguicula in Mexico, I've learned that they enjoy growing in the semi-shade of these highlands oak-pine forests. So I got out of the car and sure enough a few meters into the forest I found P.moranensis growing on N-facing hillsides. Most plants had well-developed winter rosettes and unfortunately there were no flowers left. The funny thing is that the winter leaves were sometimes long and narrow, while in other plants they were shorter and rounder. It was "just another" P.moranensis site, nothing new. P. moranensis in winter rosette with leaves sometimes long and narrow, while in other plants,the leaves were shorter and rounder. I kept driving on and near the top of the mountains at ~2300m alt., I started seeing Sphagnum growing by the road, the first time I see it in Mexico. 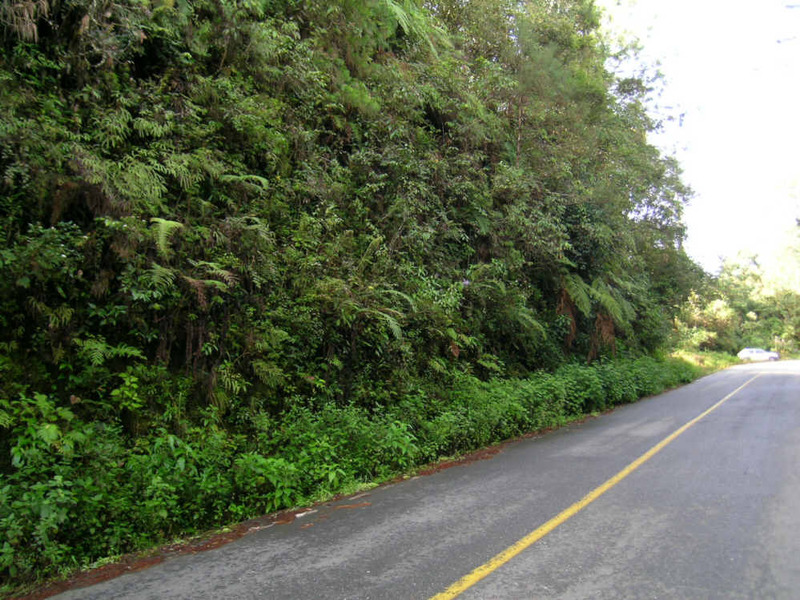 As soon as the road crossed over to the other side of the mountain, more P.moranensis began appearing on the roadsides, at ~2300m alt. It was a really wet & mossy habitat, so basically no signs of winter rosettes. I've seen numerous P.moranensis sites already here in Mexico and although I can't say I'm sick of it, I did try not to spend too much time with this "common", although beautiful, plant. What I wanted to see were flowers, to compare with all the N forms I'd seen. It took a while of searching but I finally found some. Unfortunately these were a bit high up on the road banks. They seemed more purple-blue, comparing to purple-pink ones I'd seen before. After a bit more searching I did find a few flowering plants further down, which allowed me some close-up shots. Once again there were rosettes of varying colors, although the reddish ones seemed more grayish-red than pink-red, like previous ones I'd seen. 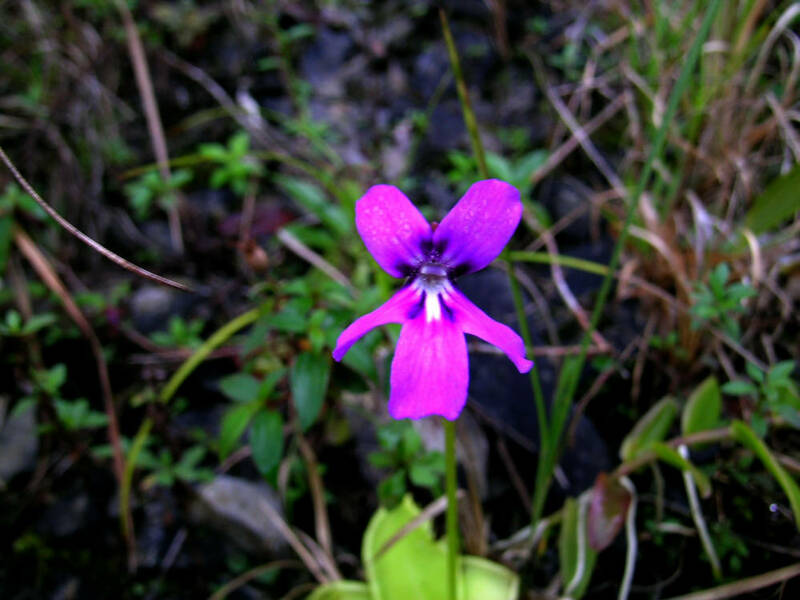 Several dozen km further down the mountain, at ~1300m alt., I came across more P.moranensis by the roadside. I think this is the lowest site I' ve seen for this species so far. There were many colorful rosettes and many flowers of varying shades (darker, lighter, more pinkish, more purplish). There were also some nice orange Epidendrum growing with them. But enough P.moranensis, I wanted OTHER species ! Driving onwards, I finally arrived at San Bartolome Ayautla, the famous P.gigantea site described by Alfred Lau. I saw the impressive vertical walls, but if I hadn't known I wouldn't have payed much attention to the yellowish blobs on thosedistant cliffs. I drove onwards trying to find where was the most accessible place to climb up to the rock walls. I know this will sound terrible, but I realized the walls are only accessible in some spots due to deforestation by the locals. There is thick rainforest at the base of the cliffs, which was surprisingly only at ~800m alt. and S-facing. This is very unusual for Pinguicula here in Mexico which are almost always on N-facing habitats (or at the most NE or NW) and above 1500m. I guess the overall rainforest humidity in that valley is what sustains P.gigantea in such sunny lowland cliff habitats. Anyways, it was already a bit late in the afternoon. It had taken me almost a whole day to drive to the Sierra Mazateca and then all along the twisting roads down to San Bartolome Ayautla. I realized I would spend ~3h or more to climb up to the P.gigantea site, photograph the plants, and climb back down. So I decided to leave it for the following weekend, when I will have the company of my good friend Ed Read. Since we usually waste much more time trying to locate CP sites than we actually spend at a site once we find it, enjoying the plants, then I was happy enough with the knowledge of where P.gigantea grew, so I could return later and enjoy the "discovery" together with Ed. I kept driving on E to Tuxtepec, then S to Valle Nacional. It was already nearly dark, but I decided to go up the Sierra de Ixtlan anyways and sleep in the village of Ixtlan. I guess I was hoping to at least catch glimpses in the twilight of P.hemiepiphytica rosettes clinging to trees by the road. What I didn't realize is that there were still over 100km from V.Nacional to Ixtlan. Furthermore, the road climbs from ~100m altitude to nearly 3000m, before going down nearly another 1000m in altitude to Ixtlan. With all the curves in the road, I only arrived in Ixtlan after 8pm. Having woken up at 5am and driven all day (much of it over endlessly winding mountains roads), I was dead exausted. And dizzy as hell from driving and trying to search for plants along the way on the banks. So I skipped dinner and went into a brief coma until just before sunrise the following day. I woke up again at 5am on Sunday and was soon heading N again towards Valle Nacional, to search for P.hemiepiphytica, of which I had seen no signs the day before. It took me an hour to drive the ~60km of infinite twists & turns of the road to the highest part of the Sierra de Ixtlan, at nearly 3000m alt., where I arrived at sunrise for a fantastic view of the lowlands below. According to the herbarium info I had, P.hemiepiphytica grew between 1900-2200m alt., on the N-facing side of the mountains, facing V.Nacional. The higher parts of the mountains were covered with pine forests, but below ~2100m or so it was all rainforest. So apparently P.hemiepiphytica grew more or less in the intermediate zone between both vegetation types. I was dreaming of seeing P.hemiepiphytica rosettes covering mossy tree trunks, like in those old pictures in Kondo's book, back then still identified as P.colimensis. I had those images engraved in my brain since I first saw them nearly 15 years ago. I guess it was one of those amazingly exotic things I never really thought I would see. I drove down the road towards V.Nacional with my GPS turned on, holding it in one hand out the window to keep the signal, while driving with the other and using my legs to help hold the steering wheel on some curves while I changed gears. At every brief straight stretch of road, I'd check the altitude - all the time looking up at the tree trunks, hoping to see the telltale rosettes. Soon I was at 2200m, 2100, 2000, 1900, and still nothing. I got out of the car to check a spot mentioned in 2 herbarium samples, but saw no signs of Pinguicula. I drove further on to another spot mentioned in a herbarium collection, but when I got there I realized the altitude was 1600m. Something wasn't right in the herbarium info, either the km mark along the road or the mentioned altitude of 1900m. So up the road I went again, driving slowly, stopping several times along the way at N-facing hillsides, taking walks around the humid forests, searching on the ground and on the trees. 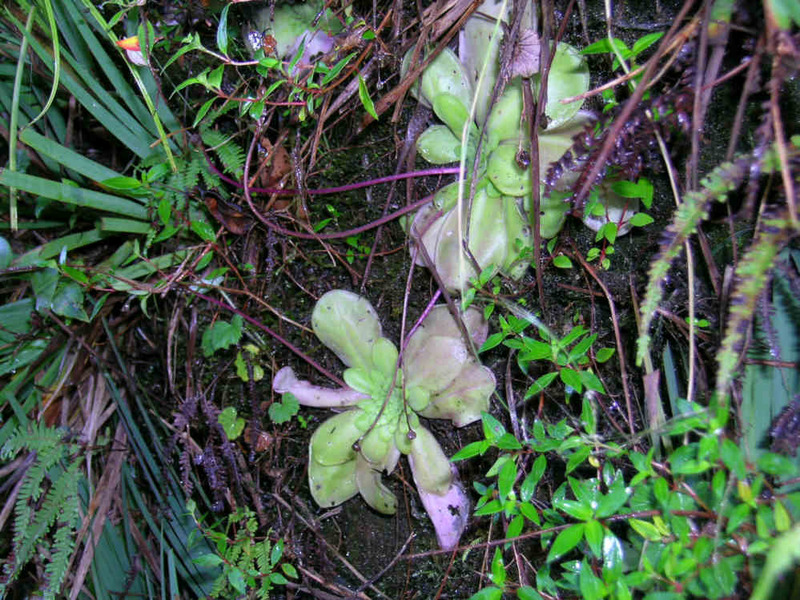 It was ~10am by the time I finally spotted Pinguicula rosettes growing on very humid, mossy, and shady banks by the road at 2100m alt., growing even in Sphagnum moss. Finally! 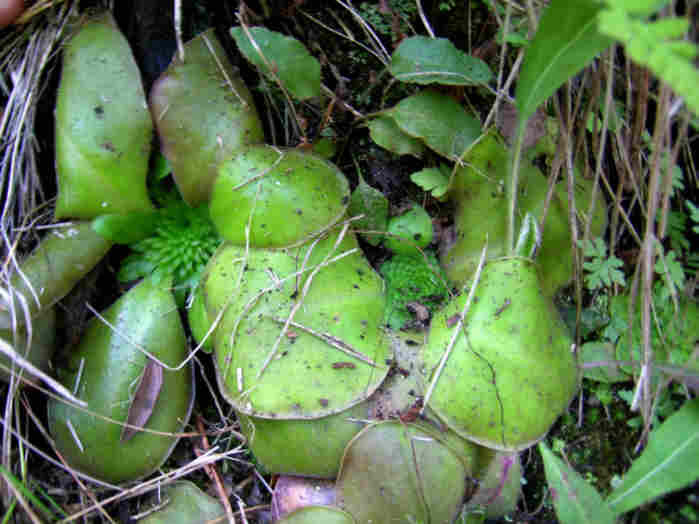 But were they P.hemiepiphytica ? 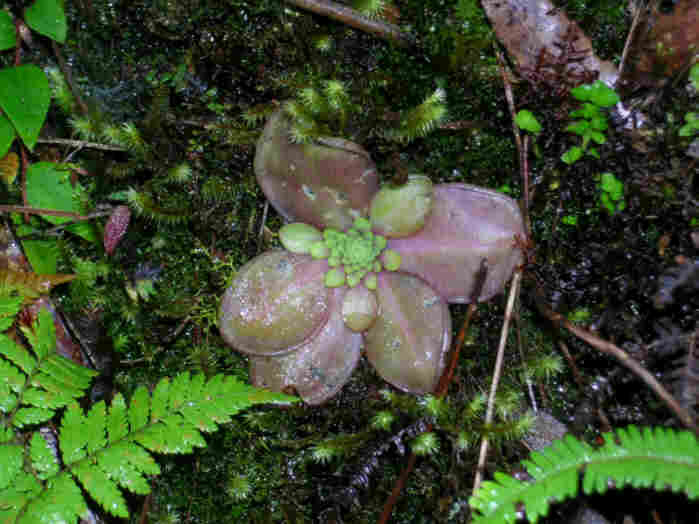 P.hemiepiphytica in habitat, winter rosette. week or two. 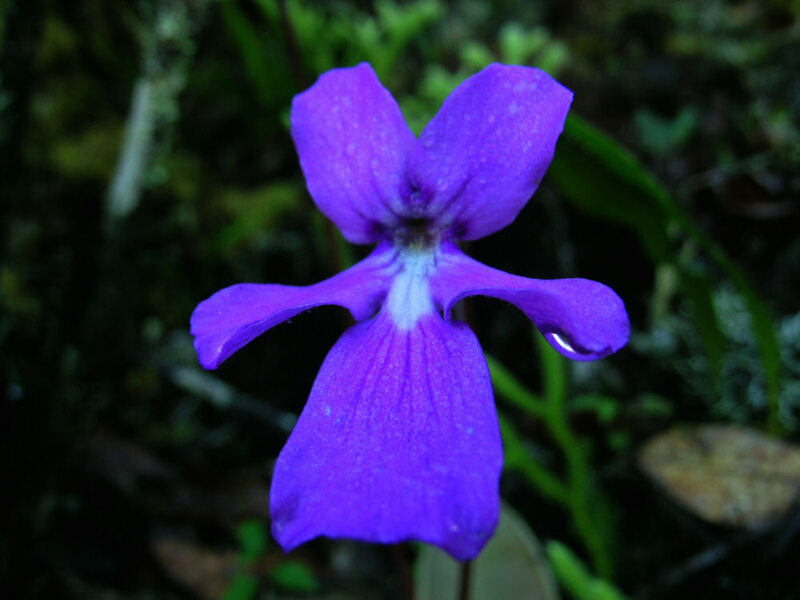 Not knowing much about flowerless Pinguicula taxonomy, I wasn't sure what I'd found. But there was something about them which rang a different bell. They had a different "feel" than P.moranensis. And then I noticed something which convinced me they were truly P.hemiepiphytica. The roots were fine and numerous, clinging to the mosses like I would imagine an epiphytic plant should. It would be an expected adaptation of any plant that didn't want to get blown off a tree by any little storm. I've never grown P.hemiepiphytica, so I don't know if it really does have this kind of roots, but my gut taxonomic feeling is that I did find this species. Yet I was still feeling very frustrated. Where the hell were those mossy tree turnks covered with yellow rosettes of P.hemiepiphytica??? I almost felt as if I HADN'T found it at all, it's not what I expected or hoped for. But after spending nearly a whole morning trying to find P.hemiepiphytica, I was ready to move on. There were still other plants to search for before driving the 500km back to Mexico City. Hopefully with Ed I'll be able to locate that "wonderland" site pictured in Kondo's book. Driving once more towards Ixtlán, but now for the first time in broad daylight, I got myself completely dizzy again, driving all those twists and turns while scanning the banks by the road. I found one or two sites with P.moranensis, but didn't stop long. I realized the vegetation along the road was all pine and/or oak forests - the habitat most described for Pinguicula in herbarium collections. This meant that every stretch of the road was a potential Pinguicula location, and I wasn't up to stopping every few meters. I drove on until I spotted a small group of yellow rosettes with leaves narrower than P.moranensis. Or so it seemed in the flash of a moment it registered in my mind as I approached a curve. So I stepped on the breaks and searched for a place to leave the car. This is usually not something simple, as I've discovered here in Mexico. Most roads do not have stop areas alongside. So either you drive farther on until you find a grassy patch (and have to walk long distances to and from the car) or you simply leave the car smack in the middle of the road with your blinkers on. Considering how empty this road was, with hardly any traffic at all, I went for the 2nd option this time. But I really can't complain since the highways in general are surprisingly good here in Mexico, both the ones with and without tolls - which I guess make up for the absurd prices charged by local tolls, I payed ~US$40 this weekend alone!! So I got out of the car and went for a closer look and sure enough the leaves were narrower. It was something I still hadn't seen in Mexico. Frustratingly, the 3-4 overlapping rosettes were out of reach on the roadbanks. Above the banks was an oak (? - my present knowledge of plant taxonomy does not include temperate trees!!! 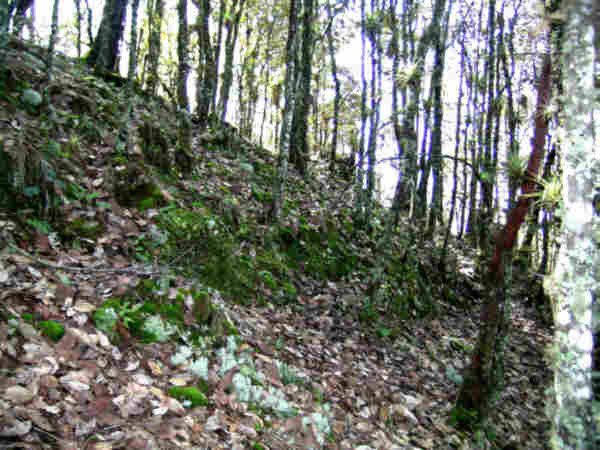 To me anything that's not a pine tree on these mountain tops is an oak tree...) forest with some mossy patches on the steeper parts of the hillside where falling leaves did not accumulate. 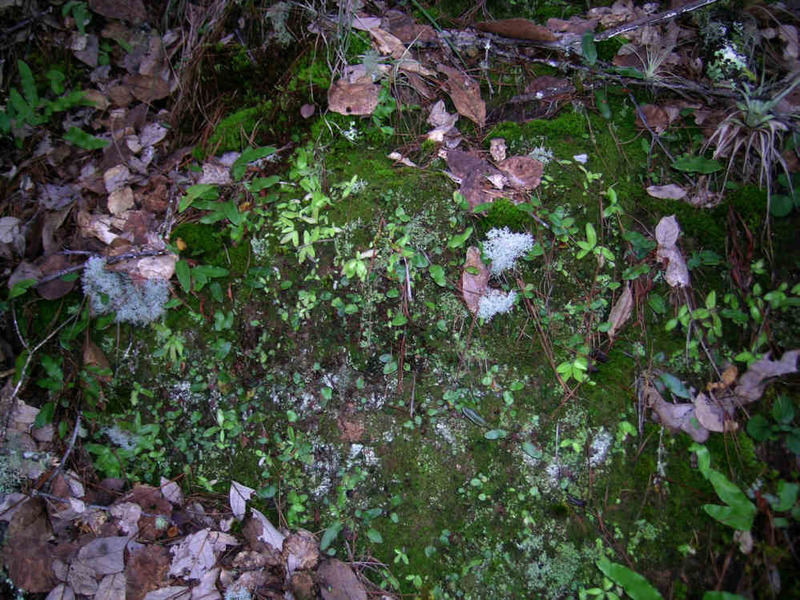 As soon as I was able to climb the road banks into this forest, I realized the narrow-leaved Pinguicula were everywhere in these mossy patches, growing in humid beige clayish soil at ~2250m alt. Unfortunetaly there were no flowers, although I did find some dead dry scapes. So what were they? I knew there were several collections of P.orchidioides from this road, but further S between Ixtlan and Oaxaca city. Could this be it? But how can one ID this species without flowers? As I thought of this I remembered P.stolonifera, a species described from this very area and which is supposedly a synonym of P.orchidioides. 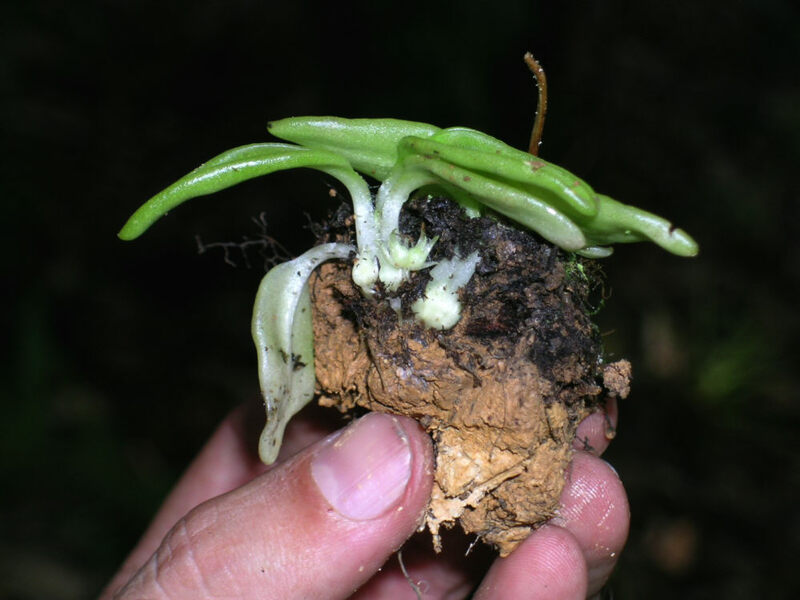 So if P.stolonifera has "stolons" , well so must P.orchidioides. To investigate this, I dug up a plant and sure enough there were little artichoke-like buds concentrated around the adult onion-like bulb. Most plants had one to several of these. Apparently I 'd caught the stolons in their infant stage, before they became "stoloniferous". 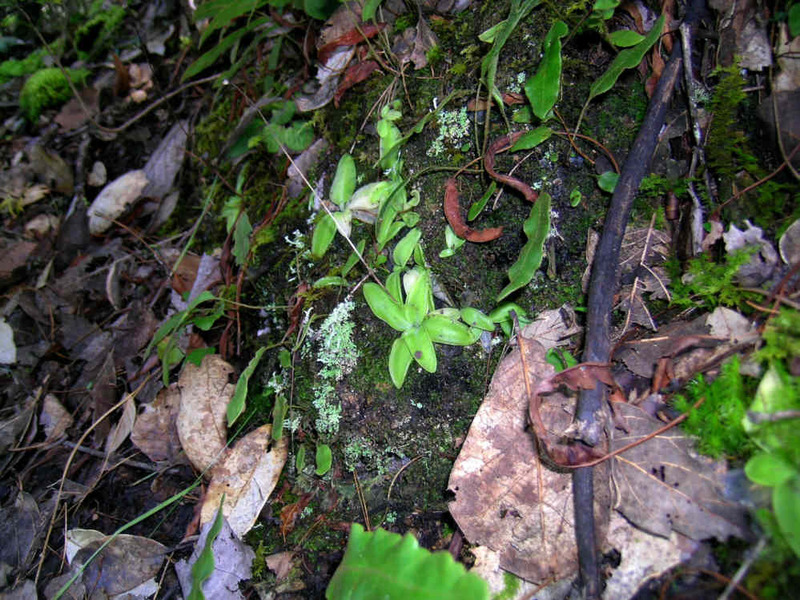 P. orchioides or P. stolonifera in its habitat. Note the onion like winter bulb and the stolon. Arriving at Ixtlan, I went for a few km along a road heading E to the Sierra de Mixes, the area where I believe P.laueana grows. But it was too far to go considering it was already Sunday past lunch time. All I wanted was to find a site where P.heterophylla and P.oblongiloba were collected, hoping I'd see them along the road like at the Cerro Huisteco near Taxco, Guerrero state, where I went over a month ago. Yet I somewhat doubt the ID of P.oblongiloba in this area. I remember Zamudio's thesis showing the range of this species being more northernly. 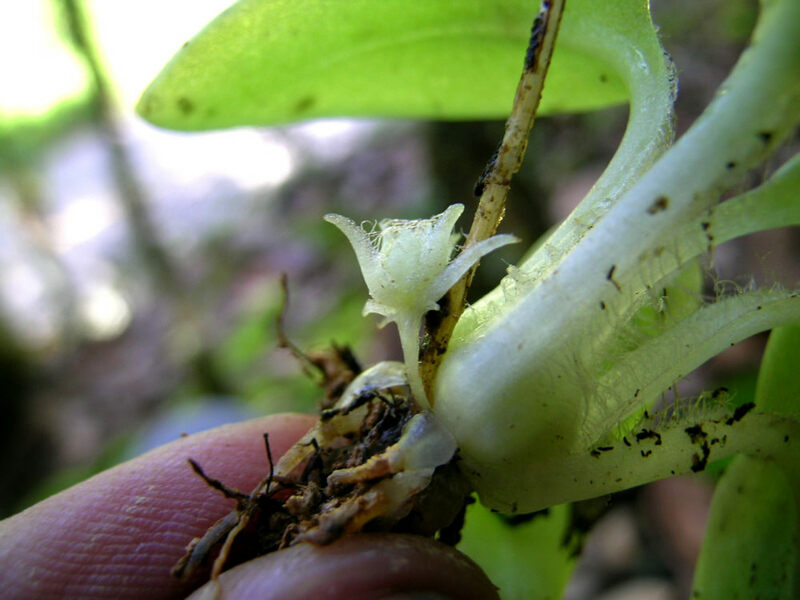 The supposedly very similar species P.orchidioides starts more or less where P.oblongiloba stops, and extends further S all the way into Guatemala. I found the area where P.heterophylla and P.oblongiloba(?) had been collected, but apparently I'd have to walk all around a pine forests to find them. Since time was short, I once again left it for next week, when I would surely find them faster with the help of Ed. I was happy for the time being knowing the general spot where they'd been found. I did find more P.moranensis growing by the road, but only got out of the car quickly to search for flowers. Only saw one, and out of reach. From Ixtlan the road goes down a mountainside for a few hundred meters before going all the way back up again on the other side of a valley. This was the last mountain before descending to Oaxaca city, and supposedly on this mountain top, along the road, is where most of the P.orchidioides herbarium collections had been made. I guess I was a bit tired, or maybe the plants were hiding in the forest, because I didn't see anything. Well, except for more P.moranensis.... I didn't even get out of the car this time. El Tule, a magnificently huge cypress tree. So I drove back to Mexico city, arriving home at ~8pm, thanks to "lighter" traffic into the city from the Puebla highway, much better than the 1-2h Sunday traffic I'd gotten previous weekends on the Queretaro and Pachuca highways. 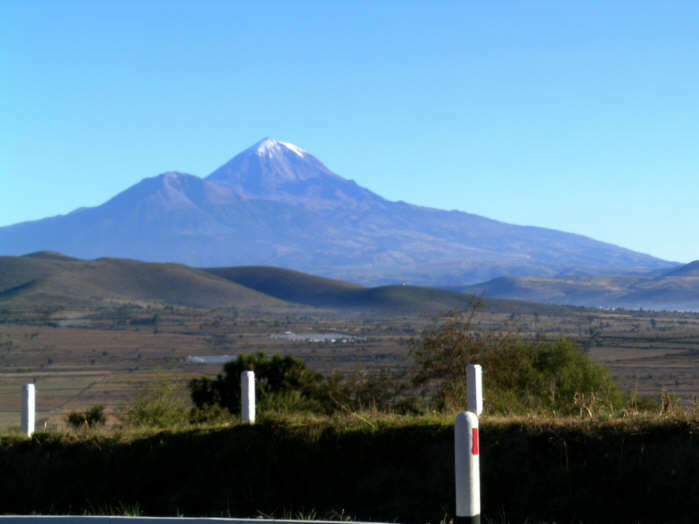 I forgot to mention that from this highway that goes to Puebla one has beautiful views of the 2 volcanoes SE of Mexico city, the Popocatepetl and Iztaccihuatl. Both rise above 5000m alt. and are snowcapped. I saw them at sunrise on my way out and at sunset on my way in. Best of all, "Popo" (which is an active volcano and earlier this year even spouted some lava) was fuming on my way back. I was fascinated to see a smoking volcano! Ah, and this road past Puebla to Oaxaca also passes by the tallest mountain in Mexico, the Pico de Orizaba (~5600m). It was snowy and beautiful both in the early morning and late afternoon, I got some nice shots! 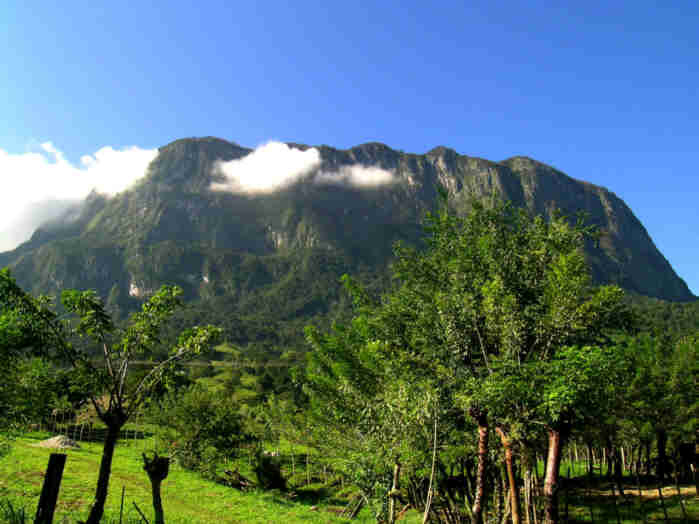 The famous and impressive Pico de Orizaba.